A little shout-out to my news-loving friend upstate - happy birthday! Funnily enough, I did a FB search for the CNN product page just now, and she was the first fan listed! You might not believe it - it was a fun tour. Our tour guide was supernice, even though they really are just walking you through the twisty windy corridors...of their offices. Heh. But, you do see the studios, and you do get a peek into the newsroom to see how they work. They did the whole greenscreen weather trick, just like in Atlanta (yep, a whole other magnet), and, at the BBC Tour, too. Apparently, we tourtakers are easily amused. I do like to think they weren't lying when they pointed at the far corner of the newsroom, telling me that it was Anderson Cooper's office. Otherwise, I'm giving a silent wave (and an eeeep) to the wrong place, every time I pass the building. 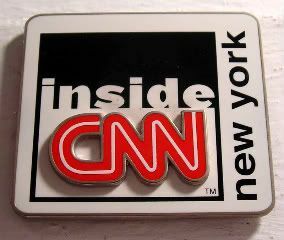 I was looking to see if I could find if they were still using the CNN: Most trusted newsource tagline (I think they are), but I found this interesting branding blogpost about CNN's house of brands. Interesting, because I've never even considered how much I've been associating the anchors with the shows on CNN - well, at least Wolf and his Situation Room, and Anderson with his 360. And, with that, Sunflower Ranch, you're in like flynn. I'm the biggest tour and little shop junkie there is! Nope. Souvenirs are made of win. I suppose I must say that, since I have a blog based on the number 1 souvenir item in the world. Hahahah. This anchor based branding is prevalent mostly in the U.S.